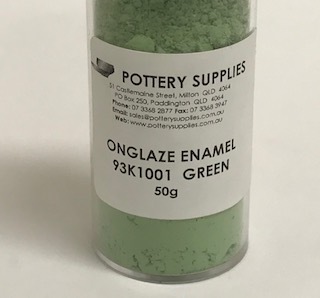 Onglaze enamel stain for use on finished glazed work. The 93 series of enamel stains are mixable to create a wider colour range. Testing should be carried out to establish results when mixed. Powders can be mixed with water and brushed onto glazed work however use of onglaze painting medium will greatly assist application. If using water please note onglazes will dry back to a powder so care should be taken when handling work. Some colours will burn out if overfired.